If you’ve been into your local smoke shop recently, you may have noticed that there’re quite a few commercially available bong cleaners on the market today. The majority of them contain salt, alcohol, acetone, and/or D-Limonene. I am sure most of you are familiar with all of these chemicals except for D-Limonene. D-Limonene it is better known as the orange oil or the orange smelling chemical found in commercially available soaps and other cleaning agents (it must contain less than 3% D-Limonene by law). D-Limonene like the other chemicals mentioned above (alcohol, acetone) is considered a hazardous material. D-Limonene is considered a hazardous material because coming in contact with large doses of it can be toxic and is known to cause cancer in lab animals. 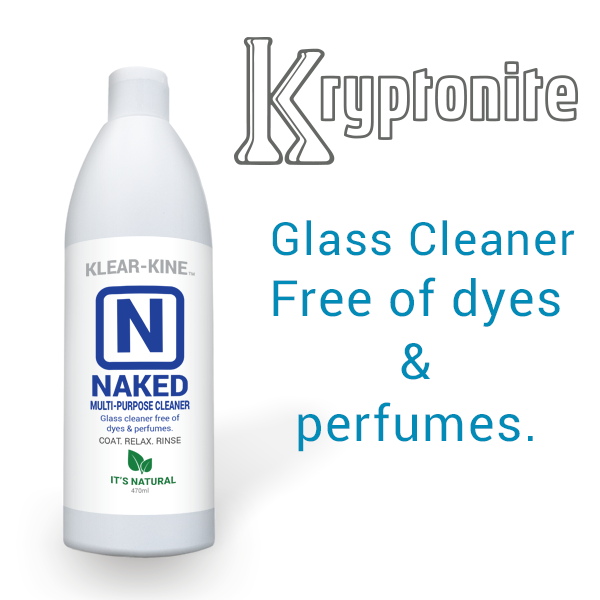 Unlike other commercially available cleaning products like Grunge Off or Orange Chronic; Kryptonite glass and bong cleaner contains no D-Limonene! Grunge Off, Orange Chronic and other cleaning products available online and in smoke shops are 100% VOC; Kryptonite contains less than 3% VOC. What makes Kryptonite a more effective cannabis accessory cleaner, other than the fact that it’s a non hazardous good, contains lesson 3% VOC and has zero D-Limonene? The entire line of Klear Kryptonitee cleaning products wash clean with water and are infused with spearmint oil. We infuse our products with spearmint oil so our customers know that when they no longer smell the nonhazardous spearmint oil, they know that their glass pipe, bong or oil rig is clean and completely safe to use it. Unlike cleaners like Grunge Off and Orange Chronic which require users to soak their pieces in the cleaning solution for 24 hours, Kryptonite cleaners only require you to soak your glass pipe or bong for approximately 15 – 30 minutes. Kryptonite is also safe to use on sinks, most clothing, hands, glass, metal, extraction tubes, grow trays, Pyrex trays and other cannabis related items. When it comes to your beloved bong or water pipe, use the only environmentally sound cleaner on the market today, Klear Kryptonite. Kryptonite is the only clay based cleaner commercially available in the smoking industry. Its unique formulation allows it to stick to the services is been applied to. Another way of saying this is that kryptonite coats your glass or other hard surfaces allowing you to maintain contact with the dirty areas. This is truly important when you have water pipes or bongs with intricate designs, P traps, chandeliers, or other diffusers built into the pipe. Grunge Off contain high levels of D-Limonene (far above 3%) and their Material Safety Data Sheet clearly states hazardous material. In comparison, the entire line of Klear Kryptonite products contain no D-Limonene and our MSDS clearly states Non-hazardous good. Grunge Off is an orange colored liquid that requires you to fully submerge your bong or water pipe so that the chemical stays in contact with the areas you wish to clean. Prior to the release of Kryptonite, Grunge Off was one of the most effective cleaners on the market. This is due to its extremely high levels of D-Limonene (far above 3%). This orange smelling chemical is extremely corrosive and will eat through pretty much anything when left on for an extended period of time. D-Limonene is also an effective termite and pest control chemical. When using Grunge Off to clean your water pipe, it must be completely submerged in this solution. This becomes inconvenient if you’re bong is taller than 6” or has multiple chambers. Today, most glass water pipes have built in ice catchers to cool the smoke, complex chandeliers that work as upside-down pea traps, diffuser plates, and in a lot of cases, ornate designs that help cool the smoke while providing a dramatic piece of art for display. Another big issue with using Grunge Off to clean your glass pieces is the slipperiness of the chemical as you attempt to rinse Grunge Off from your pipe or bong. Grunge Off leaves a slimy feel on the outside of your glass as you rinse with water. This slimy feel on the outside of the glass has caused individuals on the Klear Kryptonite team to break more then one bong. Additionally, Grunge Off leaves an orange smell on the glass. While that smell may be pleasant to some, it’s important to understand that the orange odor comes from the high concentrations of D-Limonene in their product. This should be of the utmost concern if you are consuming cannabis medicinally, as it is known to cause cancer. Now that you know the health risks and other risks associated with using cleaners such as Grunge Off, do you really want to be smoking out of a pipe or glass bong that has been cleaned with something that is not only used for termite and pest control, but also has been documented as something that causes cancer? Choose the Klear choice. Choose Kryptonite!